Someone, whom I only knew socially outside of work, once said to me, “How is it that you are a Senior Executive at work and yet so “nice”?” I immediately responded, “You have not seen my work personality!” Apparently satisfied with my response, the individual moved on to other topics. What Would it Take to Convince You to Stop Working? 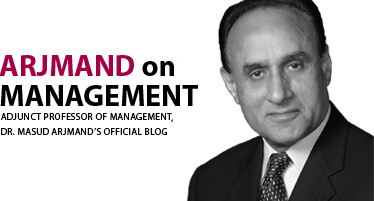 After a long career in Management Consulting with Accenture, Dr. Masud Arjmand teaches MBA/Exec Ed classes on Talent, Strategy, Leadership, Innovation, Entrepreneurship, Performance, Management, Organizational Democracy and Governance locally and internationally. This blog is meant to start a dialog for mutual learning on the influence of human dimension in these areas.